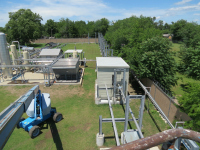 The Tulsa University Fluid Flow Projects (TUFFP) is the premier comprehensive multiphase flow in pipes research program in the world. 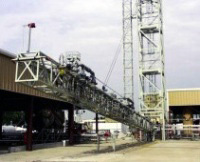 Founded in 1973, TUFFP has developed much of the technology currently used in the production and transportation of oil and gas. The summary of the test facilities and their technical specifications can be found in the following sections. For details, please click on the “Full Specifications” link for each facility. This facility operates with gas/oil/water and has been designed to study the effect of pressure on multiphase flow characteristics. 1Operating conditions are for the current project and are subject to change depending upon the project. 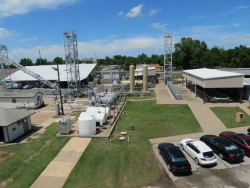 This facility operates with gas/oil/water and has been designed to study low liquid loading effects on multiphase flow phenomenon in horizontal and/or near horizontal pipelines with large pipe diameters. 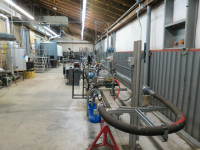 This facility operates with gas/oil/water and has been designed to study the effect of pressure and oil viscosity on multiphase flow characteristics. This flow loop has been designed for the study of gas/liquid flow behavior in inclined pipes. 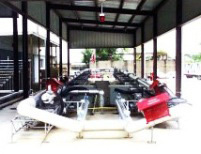 It is also capable of simulating risers and severe slugging conditions. This loop is equipped with advanced instrumentations which allows the measurement of two phase flow parameters such as liquid holdup, liquid entrainment, wave and slug characteristics, flow pattern and pressure drop. 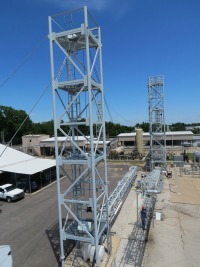 This experimental facility has been design to study gas/liquid, liquid/liquid or gas/oil/water flows. The facility is equipped with advanced instrumentation allowing the characterization of multiphase parameters such as: liquid holdup, in-situ phase fractions, droplet size distribution, pressure drop and flow pattern. This loop can be also utilized for multiphase flow meters evaluation. The flow loop operational conditions can be expanded as well as new instrumentation can be used to characterize additional multiphase parameters. 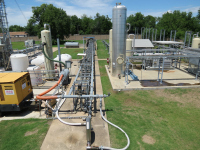 This facility was designed to study the co-flow of gas and high vicious liquid. The facility is equipped with advanced instrumentation allowing the characterization of multiphase parameters such as:liquid holdup, slug flow characterization, pressure drop and flow pattern. The flow loop operational conditions can be expanded as well as new instrumentation can be used to characterize additional multiphase parameters. Detailed information for each advanced instrument can be found in the links below. The single-phase paraffin deposition flow loop designed and constructed by PetroCanada and later operated by the Alberta Research Council was donated to Tulsa University in 1995 for use in a paraffin deposition JIP. 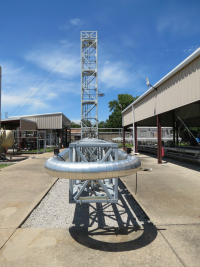 This 200-foot long, horizontal, 1.7-inch diameter, fully jacketed flow loop permits testing a variety of crude oils under laminar and turbulent flow conditions. Outstanding instrumentation, precise temperature control and state-of-the art data acquisition generate outstanding data for evaluating and developing improved deposition models. 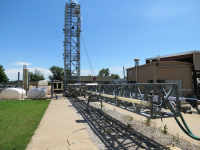 As part of the Paraffin Deposition JIP focus, a new multiphase flow paraffin deposition facility was constructed. The test section is 2-inch diameter stainless steel, high pressure (1,000 psi), fully jacketed, 75-foot long, and inclinable (0° to 90°). A waxy crude oil-natural gas mixture flows in the inner pipe, countercurrent to a chilled glycol mixture in the jacket annulus. State-of-the-art instrumentation, temperature control and a distributed data acquisition system permit obtaining outstanding data.